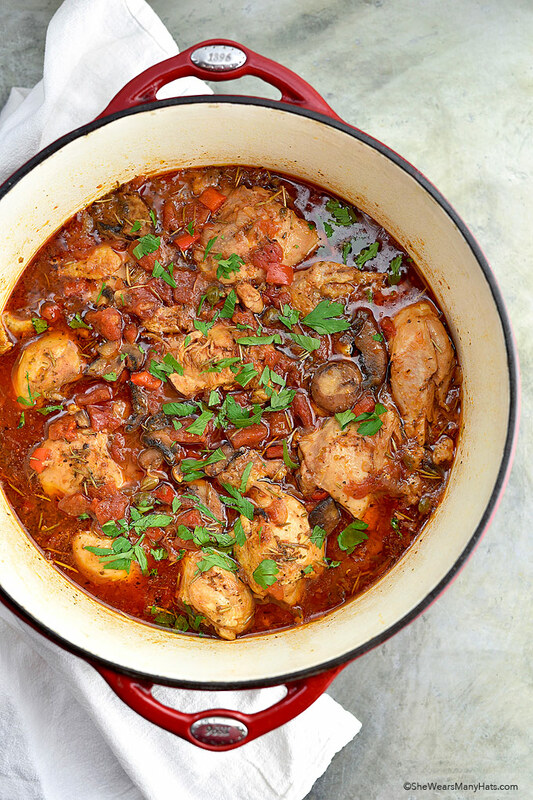 This easy classic Chicken Cacciatore Recipe made with chicken, onions, garlic, mushrooms, peppers, tomato and herbs with a bit of wine is perfect for any night of the week. Chicken Cacciatore is a classic Italian dish that will quickly become one of your favorite go-to meals for feeding a crowd or when you’re craving comfort food. This dish sounds so much fancier than it really is. Cacciatore, which means “hunter” in Italian, is basically a savory rustic one pot stew made with vegetables and meat. While basic in the technique, the ingredients come together to create a flavorful meal. This dish really elevates a stew to something so much more. This cacciatore is an excellent example of how you can take basic ingredients and turn them into a fabulous meal. There is nothing much more gratifying than that. The preparation of this one pot dish reminds me so much of how Coq au Vin comes together and equally as satisfying. If you’ve never prepared a cacciatore dish, once you make it a time or two it will easily become second nature and be part of your regular menu repertoire. A little browning of the chicken and sautéing of other ingredients is about as technical as this Chicken Cacciatore recipe gets. Once everything is combined, all of the ingredients are left to meld together into one savory, and oh so satisfying meal. 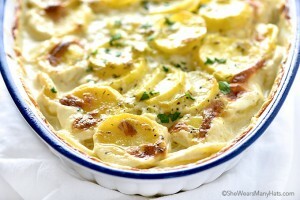 This is perfect comfort food for sure! 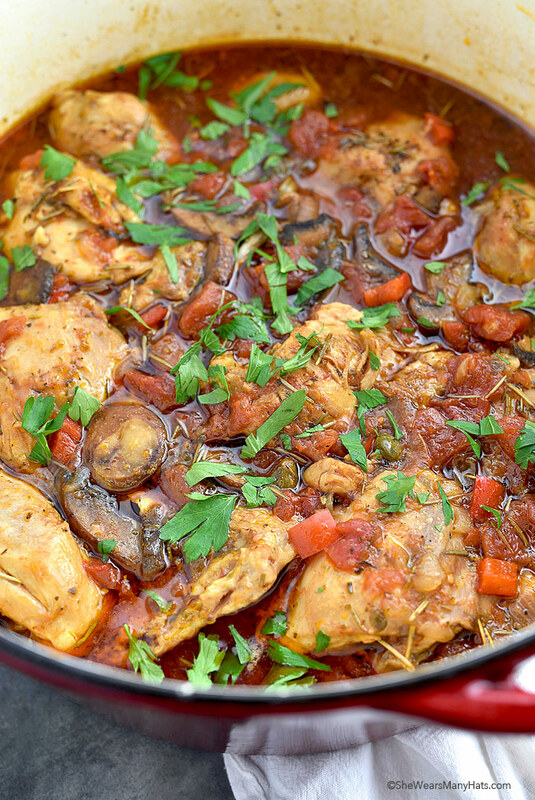 Chicken Cacciatore is perfect for making ahead of time by a day or so. It reheats very well and is great served as leftovers. Serve this dish warm with roasted veggies, mashed potatoes, pasta or rice for a hearty meal. For a lighter option serve as a stew with a tossed salad for a lighter option. 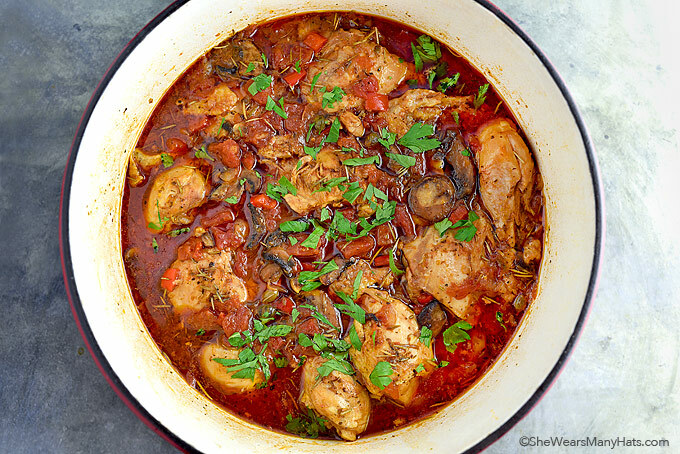 An easy classic Chicken Cacciatore Recipe made with chicken, onions, garlic, mushrooms, peppers, tomato and herbs with a bit of wine. The perfect comfort food! Heat a dutch oven or large braising pan over medium heat. Add olive oil to the pan and heat until rippling. Working in batches, brown chicken pieces about 3 minutes each side. Remove chicken from pan; set aside. Add diced onion and pepper to pan and saute for 5 minutes. Add mushrooms and continue to saute for another 3 minutes. Push all vegetables to one side of pan. Add grated garlic, capers, oregano and rosemary; stir constantly for 1 minute. Stir in wine, cook for 3 minutes scraping up any brown bits from bottom of pan. Add diced tomatoes (with liquid), chicken broth and bay leaf; bring to a low boil. Salt and pepper to taste. Tuck browned chicken into sauce, bring to a simmer, reduce heat to low; cover and cook for a minimum of 45 minutes or up to 2 hours. Optional garnish: chopped fresh parsley; grated parmesan. Serving suggestions: serve warm over mashed potatoes, roasted vegetables, pasta or rice. Fresh herbs may be substituted. If substituting fresh herbs, triple the amounts called for in recipe for dried version. Easy prep a 1-2 days ahead of time: chop vegetables, cover and refrigerate; measure herbs and cover. Originally published September 16, 2016. Should I leave the cover open a little bit so it can reduce? Or will it thicken up a bit anyway? I am using a ceramic cast iron pot just like the one in the picture but doubled the recipe. The only other difference is I took the skin off the chicken, left the bones in. Looks like a great recipe! Thank you! If you want it to reduce a bit, you could leave it off, otherwise you will have a nice sauce to use over rice or potatoes. Thanks for the recipe. I made it tonight and it was delicious! Made it! It was a hit, just wish the sauce was thicker. I served it hot off the stove. Maybe the leftovers tomorrow will be thicker. It made a LOT of sauce…. If you wish, you can thicken the sauce a bit with a bit of cornstarch or flour. Leftovers also make a great starter for soup. You can coat the chicken im flour before browning. We loved this – such an amazing sauce. I took the lid off for the last ten minutes to reduce it and it was perfect! Just served it with French beans and a nice fresh baguette as we’re on holiday in France! Will definitely be making again! I’m happy to hear that you enjoyed it, Geraldine! And yay for holiday in France! I just made this recipe today and it came out great. to make it thicker toward the end I squeezed a little tomato paste from the tube style So I found it made it a little thicker and excellent I also took the skin off but left a bone in. Thanks so much. ???? Made this tonight! Used boneless and skinless chicken thighs! Excellent! I also took the lid off for the last 10 minutes to thicken the sauce! DELICIOUS! ???? 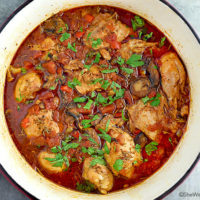 This instruction for the Chicken Cacciatore recipe : “Tuck browned chicken into sauce, bring to a simmer, reduce heat to low; cover and cook for a minimum of 45 minutes or up to 2 hours.” is unbelievable ! That’s a huge time span. What governs the amount of time that I should cook the mixture? I’m not clairvoyant ! Hello Stuart. You are the boss of your chicken cooking time, as long it is a minimum of 45 minutes and the chicken is done. The longer it cooks, the more tender it will be. Can I make it in a slow cooker? And for how long? 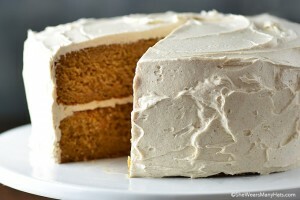 Making this right now and already looks delicious! I don’t understand why so many of the commenters would go for the boneless skinless chicken. There is an enormous amount of flavor that comes out of the skin and bones. And you can skip eating the skin if you choose, just loses flavor when removed from the cooking process. Hi Amy, I cooked this chicken recipe last night for dinner and i didnt expect that my husband would even taste because he is just not into chicken. I followed the recipe step by step except that i put alcohol on it instead of wine, and when it was cooked I asked him to taste and to my surprise he never stop eating it. It turns out that they all loved it and asked me to cook it again within soon. This is a very yummy and tasty recipe. I am so grateful I found your site. Thank you. I am so happy to hear it, Cess! I made this tonight for the first time, served it over polenta loaded with parmesian and a little butter… super savory! I used skinless/boneless chicken thighs and floured them lightly before browning. I used dried and fresh basil in place of the oregano (although I did add a little oregano too). Next time I think I’ll use fresh rosemary sprigs instead of the dried leaves. I dropped a handful of freshly chopped italian parsely and basil on at the very end, very aromatic. Ended up looking very much like pictured, maybe a little less red. We liked it a lot, thanx for the wonderful recipe! Happy to hear you enjoyed it, Michael! And thanks for sharing your substitutions. Can you cook it in the oven like you would a roast on about 325 for a couple of hours? I’ve cooked it in the oven before and it’s fine. But if you have a Dutch oven I’d at least start it off there and finish it in the oven. It’s tastes better. Excellent recipe. I added a couple of shakes of cayenne pepper and a 1/4 teaspoon of allspice for a more spicy sauce that I used over yellow rice. I did the 45 minutes and it was plenty.